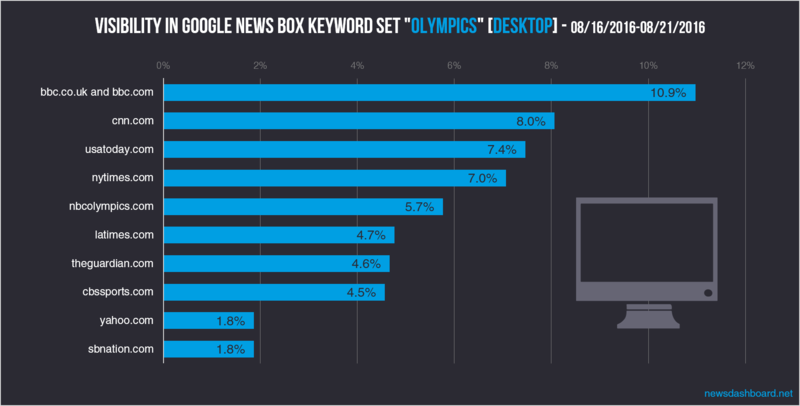 The second half of the Olympic Games – how did news publishers perform in the US Google News Boxes? Comparison Desktop SERP to the mobile SERP. The Olympic Summer Games 2016 in Rio de Janeiro ended with a big final show last Sunday. The medals table shows that the USA achieved by far the most victories. Following our analysis of the first half of the Olympics, we analysed which publishers dominated the Google News Boxes during the second half. In addition, we analysed the data of the mobile SERP (Search Engine Results Page), and will now take a look at the top 10 with the highest visibility in the Google News Boxes. BBC, CNN and USA today reached the highest visibility in the Google News Boxes Desktop. First of all, we will look at the top 10 with the highest visibility in the Google News Boxes of the desktop SERP. Both the desktop results and the mobile data were collected with the Trisolute Software News Dashboard. The first place is markedly held by bbc.co.uk / bbc.om with 10.9%, just like in the analysis of the first half. No change can be reported on the second place either; cnn.com makes it here with 8.0%. The publishers on places three and four have swapped places compared to the first analysis; and now usatoday.com makes it to the top with 7.4% just before nytimes.com with 7.0%. Place 5 is covered by nbcolympics.com again with 5.7%. For the other places, there is only one surprise compared to the first analysis – that is yahoo.com reaching position 9 with 1.8%, and therefore telegraph.co.uk does not make it into the top 10. Latimes.com, theguardian.com, cbssports.com and sbnation.com do reach the top 10 again. Espn.com was able to improve its performance compared to the first analysis, and reached 1.1% visibility, still relatively low. 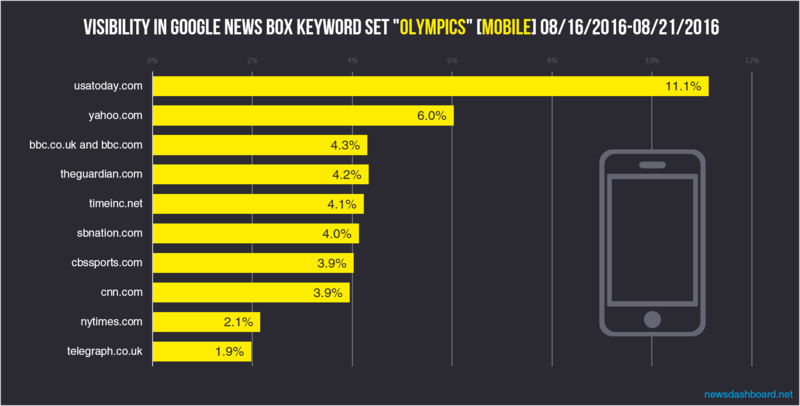 The first three places in the mobile SERP were covered by USA Today, Yahoo and BBC. Compared to the Desktop SERP, a few different publishers reached the highest visibility in the Google News Boxes in the mobile SERP. Usatoday.com clearly leads the top 10 with a visibility of 11.1%. Yahoo.com made it to place two, and is new to the Desktop top 10. Bbc.co.uk / bbc.com performs worse in the News Boxes of the mobile SERP than in the News Boxes of the desktop SERP and reaches place three with 4.3%. Some other publishers like theguardian.com, sbnation.com, cbssports.com, cnn.com and nytimes.com reach the top 10 for the desktop part as well as for the mobile part. Latimes.com and nbcolympics.com are not in the top 10 here. Instead, timeinc.net on position five and telegraph.co.uk on position ten made it. In summary, it can be stated, that similar publishers reached the highest visibility in the Google News Boxes in the desktop SERP as well as in the mobile SERP. Some publishers were able to surprise in the mobile SERP: Time Inc and The Telegraph made it to the top 10, and Yahoo reached the second place before BBC, while USA Today climbed from the third to the first position and left the competitors far behind. adam peaty, allyson felix, ashton eaton, basketball, basketball Olympics, basketball olympics 2016, beach volleyball, brady Ellison, caster semenya, claressa shields, closing ceremony, coach k, corey cogdell, devon allen, dream team, eliud kipchoge, gabby douglas, galen rupp, gymnastics, helen maroulis, ioc, iuliia efimova, katie ledecky, kerri walsh kennings, kevin Durant, medal standings, michael phelps, Neymar, olympic games, olympic games 2016, olympic games rio 2016, Olympics, olympics 2016, olympics athletics, olympics favourites, olympics gymnastics, olympics live, olympics live stream, olympics news, olympics results, olympics rio, olympics rio 2016, olympics swimming, rio, rio 2016, rio Olympics, rio olympics 2016, ryan lochte, serena Williams, simone biles, soccer, summer Olympics, swimming, taekwondo, team usa, usain bolt, volleyball.